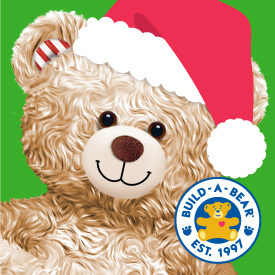 Build-A-Bear Workshop is where holiday wishes are made! Make your family's holiday season merry and bright by experiencing all the wonder that's stuffed into every Workshop adventure. This special time of the year is all about making memories with the ones you love - and the holiday season isn't complete until you visit Build-A-Bear Workshop and join the Make-Your-Own fun! 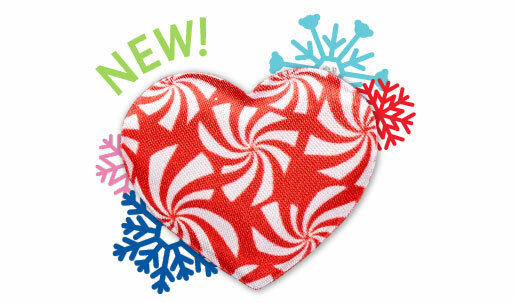 Make your wish on a limited edition candy cane heart! In store only. Everybody come on in! You're invited to add your name to the Nice List! This time of year is all about making memories with the ones you love – and it’s not Christmas until you visit the Workshop and join the Make-Your-Own fun! Come in to shop our new holiday collection, make a wish during our special Candy Cane Heart Ceremony and add your name to Santa’s Nice List! More in-store festivities throughout the season include special weekend appearances by our mascot Bearemy in December and a FREE in-store holiday scavenger hunt all holiday season! Plus, Guests of all ages can also enter for a chance to win their Build-A-Bear wish list with our NEW holiday sweepstakes! 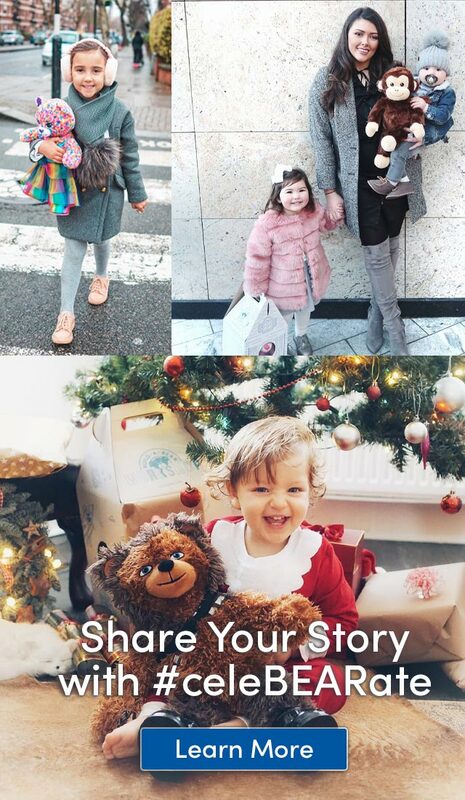 You can enter for a chance to win a $200 Build-A-Bear gift card with this exciting sweepstakes in stores before December 24th – there’s a winner in every store! NO PURCHASE NECESSARY TO ENTER OR TO WIN. Entry to the sweepstakes is free. A purchase will not increase your chances of winning. 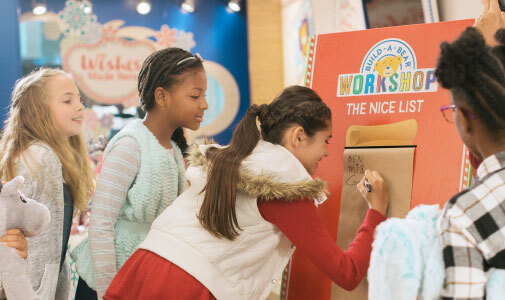 The Build-A-Bear Workshop® “Win Your Wish List” Sweepstakes begins on 11/1/18 and ends at 11:59 CST on 12/24/18. For a full set of Official Rules ask in-store at participating Build-A-Bear Workshop locations or visit: www.buildabear.com/wish-list-rules.html. Void where prohibited. Open to legal residents of the 50 United States, District of Columbia, Puerto Rico, and Canada (excluding Quebec). If Entrant is a minor in his/her state/country/territory/province of residence his/her parent or legal guardian must sign the entry form in order to enter the Sweepstakes. 1: In-Store: Complete and submit an Official Entry Form at participating Build-A-Bear Workshop® locations. In-Store entries must be received by close of business local time on 12/24/18. US/PR residents: P.O. Box 488, Syosset, NY 11791-0488. All mail-in entries must be postmarked by 12/24/18 and received by 12/31/18. 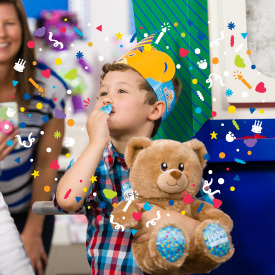 PRIZES: One (1) winner per participating Build-A-Bear Workshop store (as defined below): A $200 USD Build-A-Bear Workshop Bear Buck$® gift card. Retail Value: $200 USD. Terms and conditions as stated on the gift card will apply. Many will enter, few will win. Parental consent will be required prior to the awarding of a prize to those who are under the age of 18 or otherwise under the age of majority in their state/territory/province of residence. Prize Allocation will be via a random drawing and the prizes awarded as follows: 297 stores in USA and 14 stores in CAN with 1 prize to be awarded per store. Discover Gifts with Heart for Everyone on Your List!" Bring the birthday boy or girl in to count their candles any day during their birthday month. 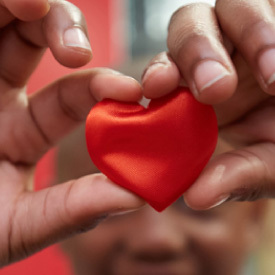 Make holiday wishes come true for local children this season by donating to Toys for Tots! The Fun Is Always On! 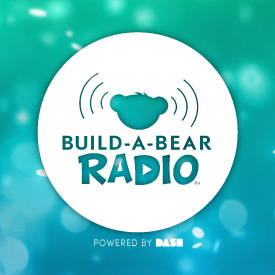 Listen to our NEW streaming radio station powered by Dash™!